Don't take our word for it - hear what our customers say about our service! Revvies was an amazing addition to our day. I was nervous on my way to the ceremony, but Justin put my father and I at ease with his good nature and professionalism before we got to the church. My husband and I loved taking photos with Justin's 1947 black Cadillac. All of our guests commented on this stunning addition. The photos came out so beautifully and we felt like royalty rolling up to our reception in this car. If you are considering, definitely do it! You won't regret this touch of elegance on your special day. 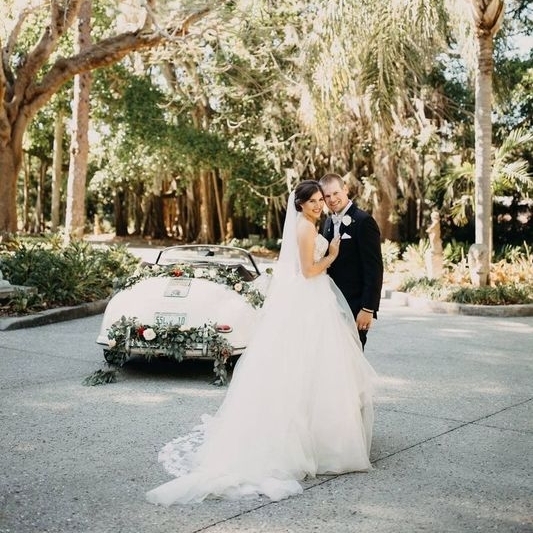 As a local wedding planner in Sarasota (NK Weddings), we've always had a need for vintage car rentals in our industry, and we LOVE working with Revvies! Owner Justin & his wife Tammy are so great to work with and their vintage car collection is amazing! They're super professional, very reliable, and always on time. Revvies is the place to look for that extra pop of detail on your big day or special occasion! We used Revvies’ “Sally” for my daughter’s wedding getaway car this past Saturday. It was a gorgeous, red 1965 Ford Mustang Convertible, which was SUCH A HIT! From the moment I contacted them, to the follow up email afterward, they were ON POINT! My daughter and new son-in-law were whisked away as if they were in a dream. They were treated well and said it was an AWESOME experience. I HIGHLY recommend this company! I had the privilege of using the Porsche from Revvies in my engagement shoot and it brought the vision I had to life! Joey and I loved how professional Revvies was. They showed up with the car in perfect condition; moving it in any direction we needed in order to get the ideal shot! I would recommend them to anyone that is getting married, or is needing stunning vintage cars for pictures! We had so much fun with Revvies’ classic cars at our wedding! We took pictures with the Porsche and our getaway car was the Mustang. It was so nice to go for a scenic drive after our reception and our driver was great!